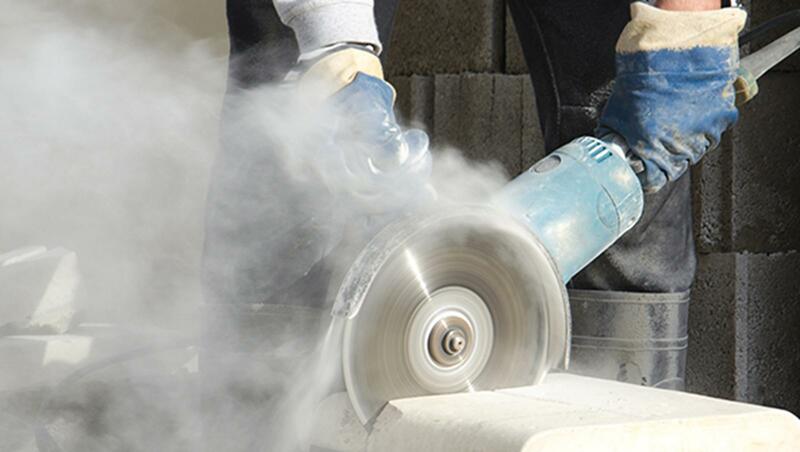 Do you know what silica is and why exposure to can be harmful? Silica occurs naturally as a substance found in sand, clay and most types of rocks. It also occurs in concrete and bricks, so if your job involves working with these materials, you could be at risk of breathing in silica dust. Silica can also be found in filler and some types of plastic. The dust from silica can be fine enough to breathe in without realising, meaning you could be breathing it deeply into your lungs where it is harmful to health. The occupational risk of breathing in fine silica particles affects many industries. These include demolition work and construction which involve stone, brick, concrete, mortar and quarrying. Other industries affected include slate mining, pottery, tile and brick manufacture, concrete production, masonry, kitchen worktop production, sandstone blasting and ceramic glaze manufacture. Some activities produce more dust containing silica, such as drilling, cutting, grinding, chiselling, sanding, rock crushing, polishing and shovelling. In the workplace, any spillages that are not cleaned up properly can cause an accumulation of dust. Dry sweeping instead of wet cleaning can make the build-up of dust worse. Other activities that stir up dust include the movement of vehicles and people resulting in fine dust particles staying in the air. The particles are so fine that they are not visible to the naked eye. So, how can silica dust harm your health? Breathing in dust deeply into your lungs could contribute to the development of serious lung disease. After many years of exposure, silicosis can occur, which makes breathing more difficult and increases the risk of developing lung infections. Extremely high exposure can cause these problems much quicker. A group of lung diseases known as Chronic obstructive pulmonary disease include emphysema and bronchitis. These conditions lead to serious breathlessness, coughing and result in chronic disability. They are a major cause of death and can be caused by prolonged breathing in of any type of dust, including silica. Smokers are at an increased risk. High and prolonged exposure can also lead to lung cancer, which is also increased if the person suffers with silicosis. The good news is that the risks from silica dust can be controlled so there need be no risk while carrying out work duties. If your workplace uses an LEV system, find out if the way you work needs to change to benefit from maximum protection. Have you been trained in the correct use of the control equipment? Would you be able to tell if the system wasn’t working effectively? You must receive training so you can recognise the signs that any dust extraction equipment is not working properly. VIX Index, What is the fear indicator? Binary Options – Earnings Or Cheating? What Is The Forex Market And How Does It Differ From The Stock Market?